Not My Daughter... Find a Cure Now! Not My Daughter… find a cure now! bridges the gap between generations to raise breast cancer awareness while contributing to the search for a cure. Inspired to provide help and healing for those who need it most, we are striving to make an impact in our local community. With your support, Not My Daughter... find a cure now! can leave a legacy of hope for our daughters and future generations. 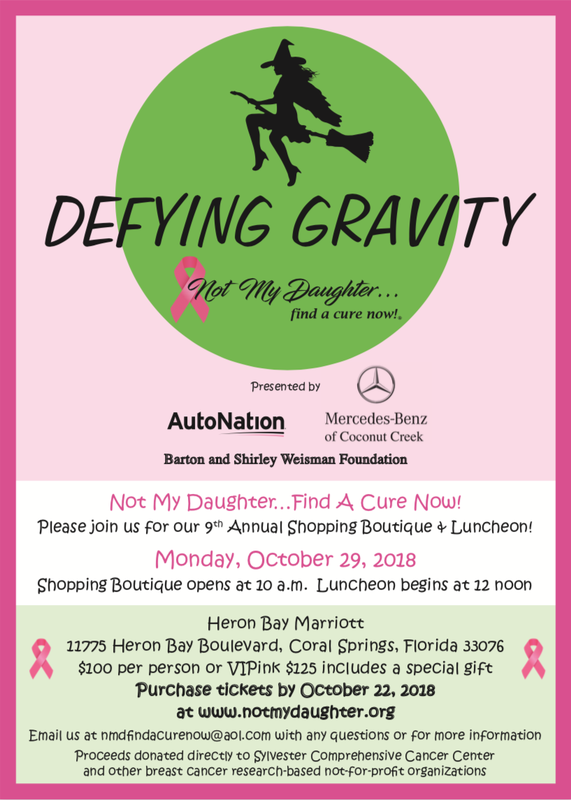 Founded in South Florida in 2010, the organization was created by a group of local women who were personally affected by breast cancer. Since it’s inception, Not My Daughter... find a cure now! has generously donated 100% of proceeds to breast cancer research-based organizations. JUST ANNOUNCED: OUR 9TH ANNUAL EVENT! FOR TICKETS, VISIT US ON EVENTBRITE! Find out about how we are working towards a cure for breast cancer and making an impact in our local community. Attend our annual fundraiser, become a partner, sponsor us, join the committee or donate to help us get one step closer to finding a cure.